It was in the early 20th Century, a Chinese immigrant has prepared a kind of medicated Chinese tea for his family members to invigorate their body from heat and lethargy due to strenuous physical labors and exposure to the scorching sin. Over time, more friends and relatives began to consume the medicated tea on a regular basis because of its medicinal efficiency. In 1963, Mr Foong Chow Hwey, the son of the Chinese immigrant began to commercialize the medicated tea name as Tan Ngan Lo in Malaysia aiming at bringing the health benefits of the tea to the general public. A company was subsequently incorporated as WEN JIANG MEDICAL INDUSTRIES SENDIRIAN BERHAD to manufacture and market the product. Today, the Tan Ngan Lo medicated tea has become a popular household name. It is now being consumed at homes, in offices and coffee shops. It is presently exported to countries such as Singapore, Brunei, Australia, Japan, UK, USA and China. Tan Ngan Lo medicated tea is made from herbs and manufactured under the Good Manufacturing Practices (GMP) environment. It is the first medicated tea product to use filtered teabags in Malaysia. This traditional medicated team becomes more hygenic and convenient to prepare. 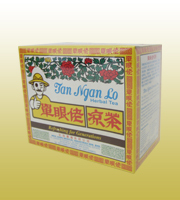 Tan Ngan Lo medicated tea is effective for relieving body heat, flu, sore throat and minor diarrhea. It is very convenient to those who are away from home.Tan Ngan Lo medicated tea can be consumed in several tastes, a combination of prune, salted lime or salt. Remove teabag from sachet. Immerse the teabag into a large cup of hot water. Brew for 2 minutes before serving. Add salt or plums for flavor. Use two teabags for stronger taste. Store in a cool, dry place.